• 3/16 x 2'' inch machine screws or carriage bolts. 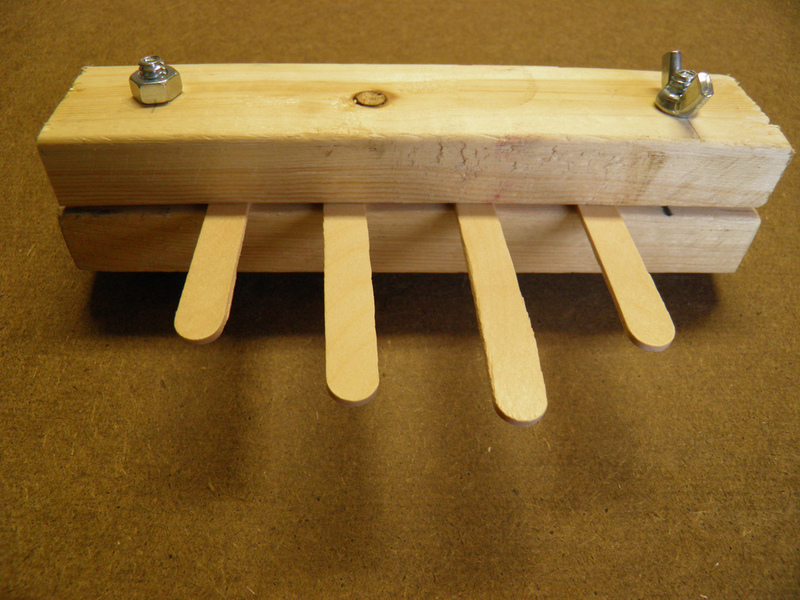 Constructing the Thumb Piano is very simple, cut the 1x2'' to length (5-8'') and then drill a hole with the correct sized bit centered and about an inch from the ends of both pieces. 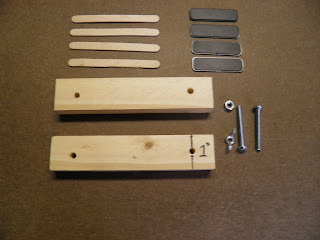 Use the machine screws to hold the two piece loosely together. You can use 2 wing nuts or one regular nut and one wing nut. Insert the popsicle sticks with different lengths sticking out of the 1x2'' sandwich and tighten the nuts until the sticks don't sound buzzy when plucked. If you want to adjust the sticks you only need to loosen one nut, this is why the second wing nut isn't really necessary. The same basic rule about tone that applied to the wind instruments applies to the Thumb Piano the longer the resonator in this case the sticks the lower the note it will produce. For more dramatic example of this try pressing a yard stick or dowel firmly to the edge of a table and plucking the end. The more the stick hangs off the edge of the table the lower note it will produce, hanging less off of the table will produce a higher note. 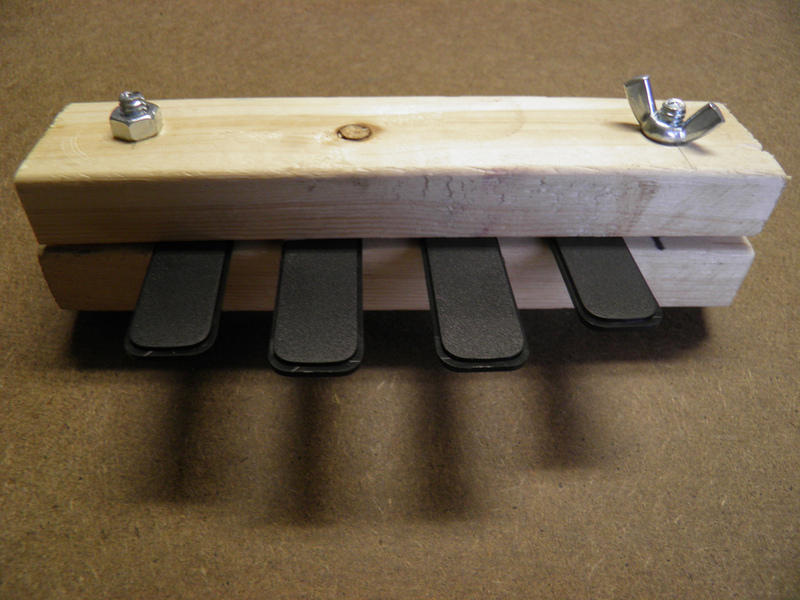 Most people's initial reaction to this thumb piano is that it doesn't work, alone it will only play very softly. However, press it up against any hardish surface and suddenly it plays very clearly as the object will carry the vibration over a larger area giving it more air moving power. However, not all things will transmit sound equally, and it can be an interesting experiment to find what materials work best and worst to amplify the Thumb Piano and then look at those materials similarities and differences. Another option is electronic amplification, while not practical for large groups it can be interesting for demonstration purposes, and can serve as general purpose contact microphone. • 1/8'' plug with cord, or alternatively you can use the Radio Shack unwired stereo plug and add you own wires but the quality can sometime be lacking. The basic idea is to connect piezo disk to the ground wire and one of channels of the 1/8'' plug. As the amplifier is mono, if you choose the wrong channel it might not work so switch the wires around until you can hear a sound when you tap on the disk before soldering it. Once its all together its as simple as taping it to you Thumb Piano or anything else you'd like to amplify. Here's one employing a grounding bar and a wooden salad bowl. Here are several examples using various key tine materials, like bike spokes and skewers. 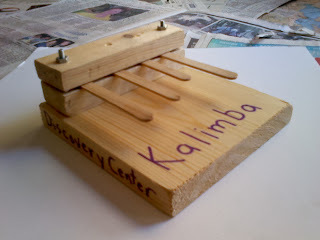 We have discovered that adding a sound board to the thumb piano (kalimba) improves the sound and fun to be had. 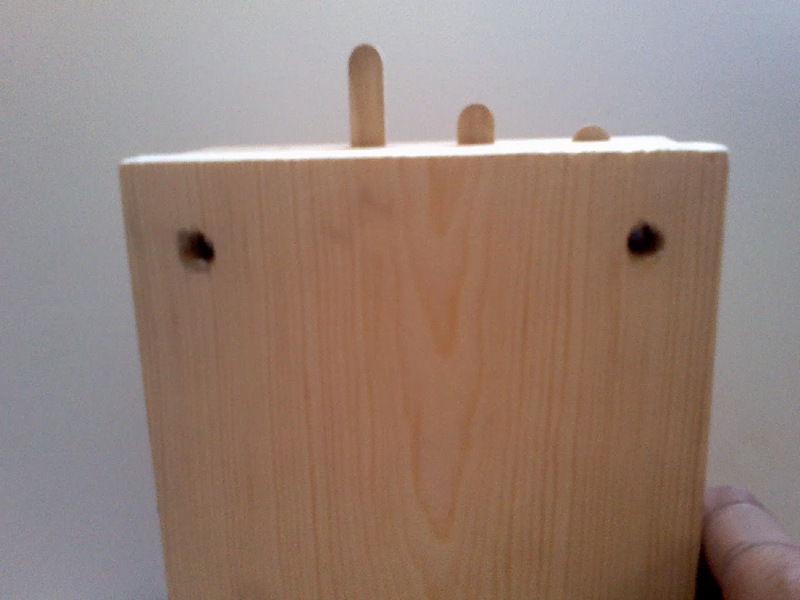 Countersink the machine screws or carriage bolts about a quarter inch into the bottom piece of wood. This allows the kalimba to lay flat. This base gives a clear sound and the player something to hold on to. 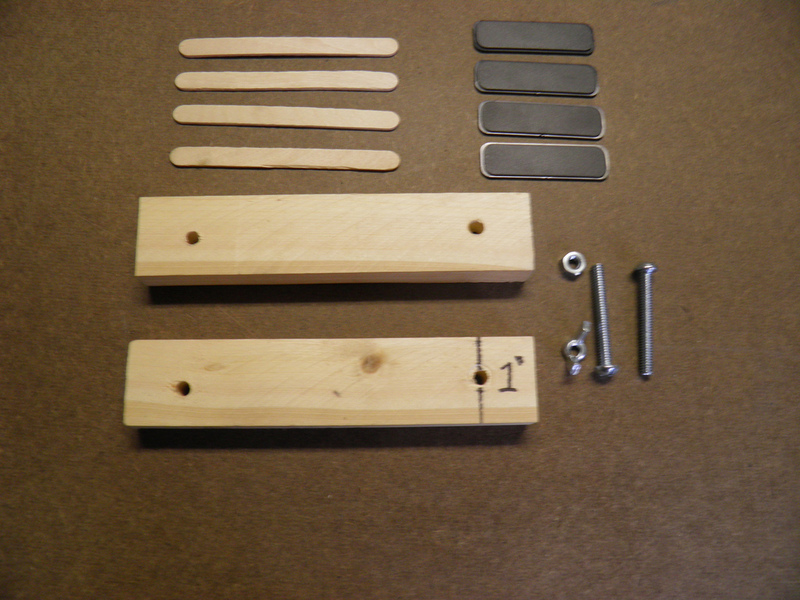 It is a big improvement in the finished project for only about 40 cents more per project. Let us know if you have any other improvements!